Description: A weedy vine also known as "Woodbine". Introduced into this country by European settlers. 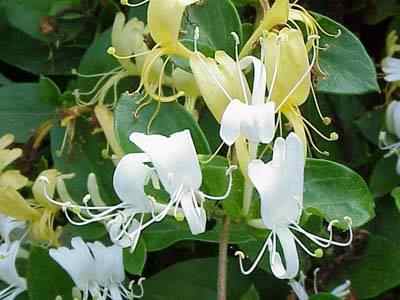 Covers the ground bushes, and trees, flowers are yellow and white with long curved stamens projecting. Lower leaves may be lobed, fruit is black. Flowers are loaded with sweet honey like fluid, very fragrant.